need to access keywords to create your successful online business. If you create a web site, without keywords the site contains articles that people may or may not want to read. If you create a web site with keywords then you stand a better chance of people actually wanting to read what you have created. Finding keywords with keyword tools shows you the searches real people are entering into the search engines. This means actual people are looking for this information. So as long as you create very high quality relevant information about this keyword and get ranked highly, when people search for that keyword, yours will be the site that is returned. So if you want free traffic from search engines then you need a tool which will show you information on each of the real searches and what else people are searching for close to your keyword. Where can you get keyword data from? Google adwords – or google ads as it is now – is the one tool most people start with. It is free, although the sign pu requires card information, until you run a campaign you will not be charged. It is getting more difficult to get accurate information without paying for campaigns now. But not impossible. This tool does not show you the level of direct competition. it can give you a lot of inspiration for other articles within your niche. 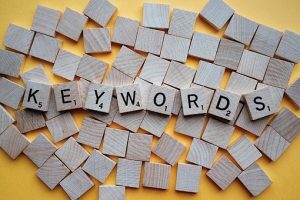 Typing your keyword into Google will show a drop down list – or Google instant – even before you have finished typing in your keyword. it is worth keeping an eye on the list as this can give you inspiration. At the bottom of the search page are related search results, again which are worth a glance. All of these results give no information of numbers of searches, just that they have been. Showing volume, cpc and competition. 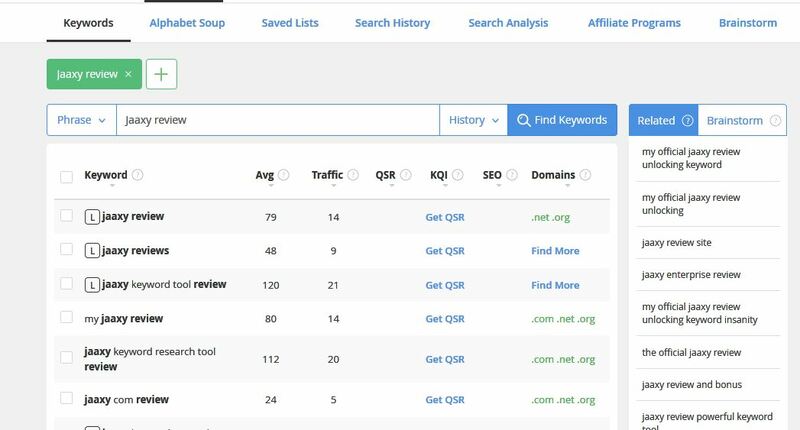 This free tool is very useful in finding other search terms people are using. The cpc and competition are useful if you are doing adverts, otherwise you can’t really gauge anything from them. A keyword research tool for beginners of internet marketing. More advanced marketers may be frustrated with some of the features. This intuitive Tool will get you up and running, finding useful keywords within seconds. Optimise the search term you are ranked for. returned with masses of useful keywords. Put in a URL and see the keywords associated with that article. Do multiple searches at once – only in pro or enterprise, not available in the free trial. You want to know the rank of an article you have published. Then use Siterank. You can setup an automated track or just a one off. Enter your keyword and your url and click ‘track this keyword’. Within seconds you will have your result. Save time not having to ‘go incognito’ to get accurate results. Use the auto track to see the progress of your articles. Find affiliate programs from Click Bank, Commission Junction, Digital river and Link Share. Forget having to log into each one separately, find what you are looking for in one place. Collect words or phrases related to your niche and keep them in one place. 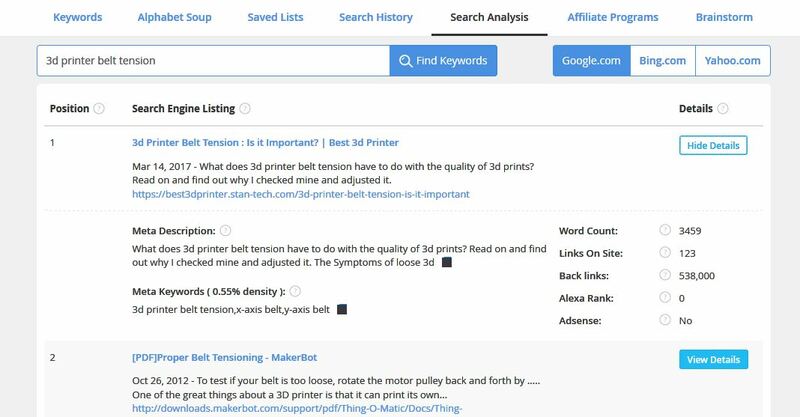 Click on the brainstorm queue and be taken to the keyword search panel, showing you related keywords. Enter your seed keyword and click the ‘find keywords’ button. Save time from using the ‘alphabet soup‘ technique in Google. Scroll across the alphabet to see the other letters results quickly. Save your search to a list. If you are working on a few ideas, save your searches to come back later. No need to rerun all the data is saved. Compile lists for customers or bonuses. Deep dive into niches to see if there is enough ideas to make it worthwhile. After finding your ideal keyword, check out who is ranking in the top spots on Google. Find their important metrics before you go in competition with them. Get ideas for your meta keywords – even though Google does not use them! 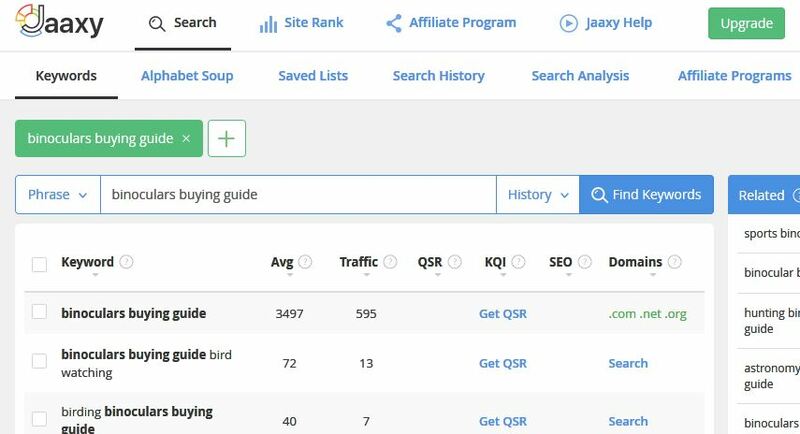 In the market to flip domains – let Jaaxy help you find the most searched ones. Click on the end icon to see what is available. dot com, dot net or dot org. These are the main ones to go for. Just click on the ending you want to be taken to site domains for an easy purchase. Can’t remember what you were searching for last week? With Jaaxy you can just scroll down and see. There are three training videos, taking you through the workings of Jaaxy. Don’t be put off by the fact they are the old interface, the inner workings are the same, but improved. With this easy to learn platform you will master getting low competition keywords to help your website SEO. Created by Kyle Loudon & Carson Lim, with a known history within internet marketing. They have been in the business for over 20 years. 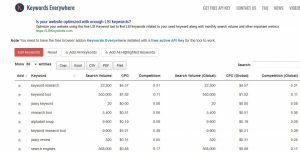 little online keyword research while you wait and save the results. Data source is collected from the major search engines. Google, Yahoo, Bing Live and others. Check out what Carson has to say inside the Wealthy Affiliate program. Manual qsr search, except in enterprise, can be a bit of a pain but no real hardship. Only Enterprise has the automatic domain showing. Appears to only work worldwide – no local country searches. Expensive for what you are getting. You can ‘ have a go’ with Jaaxy to see what it is like. 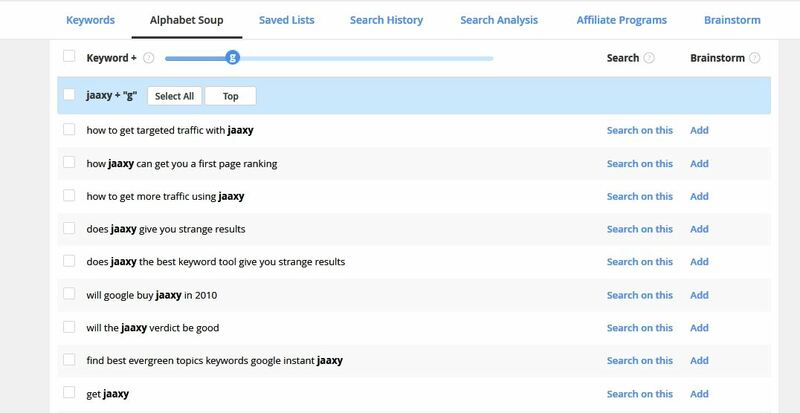 I do like Jaaxy as a simple to use keyword tool. But I do have a problem with it. The number of returned searches. I have used other tools where you get thousands of keywords returned, two thirds of them useless. But I would like the choice to remove them. The other problem I have with it is the pricing. If you are a beginner, which is where I would aim this keyword tool, then unless you already have hosting, email, a high level of technical support and a massive community helping you, I would recommend looking at the other program Kyle and Carson have created – that is the Wealthy Affiliate program. For the price of the pro version, and if you pay annually, you can get hosting, emails, Jaaxy lite, tech support, community backup and masses of high quality training all together in one package. Jaaxy lite gives you 90% of the features of Jaaxy pro. All of this for less than the price of Jaaxy pro. These are some tips on techniques i use to get the best out of Jaaxy. you may get something you are looking for. When searching for keywords to start your site then go for low traffic and qsr up to 100. Keyword – this is the phrase that users type into the search engine to find what they are looking for. 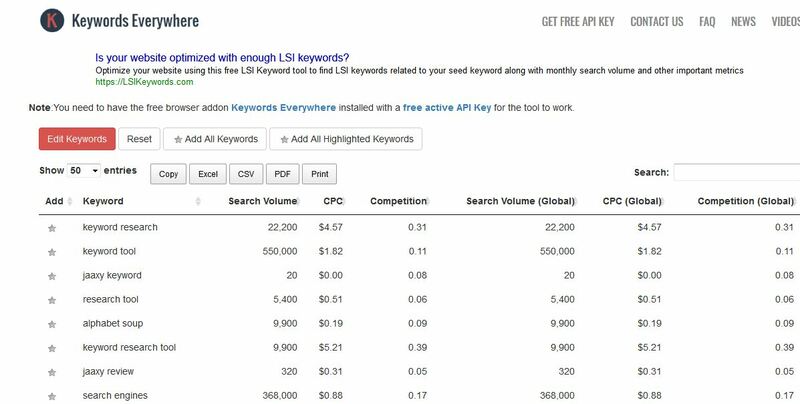 Avg – this is the average number of searches per month for this keyword. Traffic – number of visitors you could expect to your site if you ranked on the first page of the search engines. QSR – the Quotes Search Results. The number of competing sites that have the exact keyword. 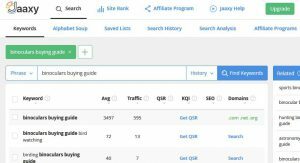 KQI – the Keyword Quality Index. A gauge on the quality of the keyword, green = good, yellow = ok, red = bad. 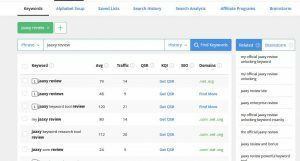 SEO – a score based on the traffic plus competition. It is the likelihood of you being able to rank on the first page of the search engines. Domains – the availability of domains related to this keyword.